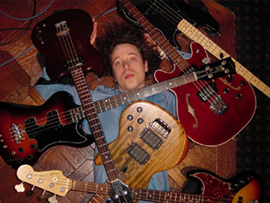 Justin Meldal-Johnsen is an American bassist mostly known for his work with Beck. He played bass on Tori Amos’ From the Choirgirl Hotel (1998) and Strange Little Girls (2001). In the 2000s he also worked with Pete Yorn, Courtney Love, Charlotte Martin, Black-Eyed Peas, Garbage, Goldfrapp or Dido.